Join artist Gretchen Andrew in an investigation into the notion of ‘becoming’. 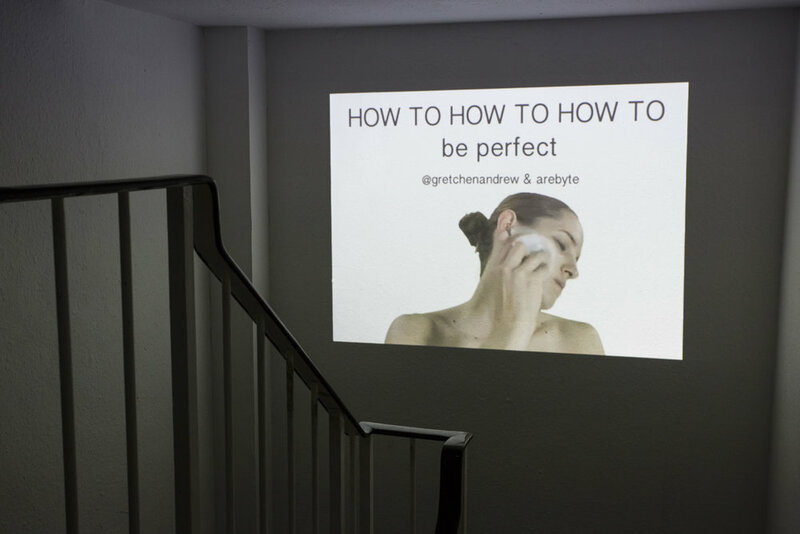 Learn how to ‘how to eat like a Russian astronaut’ in an intimate dinner event, ‘become a novelist’ in a You Tube inspired book launch, and explore the limits of attaining perfection, in an ongoing exhibition this Winter in Hackney Wick’s arebyte Gallery. Andrew is a California born, London artist who works in online and offline mediums. She started painting in San Francisco after becoming convinced that the Internet can teach you anything. Taking a knowingly disjointed approach, both her exhibition and accompanying events explore the Internet as a resource of ingredients from which we each cook up a formulaic, yet individualistic recipe for perfection, whatever that may be. Each body part is perfected in isolation, with the absurd suggestion that once assembled, a perfect person is complete. Be our dinner guests for over three courses of culturally and professionally defined food and instructions. Uncover alternative modes, motivation and styles of eating. Taking place in the artists studio, EAT LIKE will feature installed works from her digital and painting practice. As part of HOW TO HOW TO HOW TO’s investigations of what you can and cannot learn, and by way of learning and become, EAT LIKE explores the link between food and identity as expressed through YouTube “how to eat...” searches. Expect a Performance Menu of Classist drinks, Professional appetisers, Religious mains and an Internet phenomenon dessert. Join us for a book launch with a difference, as artist Gretchen Andrew presents the experience of writing her first novel, with YouTube as her only guide. The project explores the process driven novel and investing creative excuses to combat the common fears of creation"
As part of her residency at arebyte, artist Gretchen Andrew deploys the looping GIF medium to explore what you can and cannot learn, and by way of learning, ‘become’, by following “how to” videos on YouTube. HOW TO HOW TO HOW TO write a novel applies this self-taught process to writing a first novel. About Gretchen Andrew (born in California, 1988) started painting in San Francisco after becoming convinced that the internet can teach you anything. Her practice incorporates traditional oil painting and related investigations of knowing and becoming. She has completed projects or exhibitions with The New York Metropolitan Museum of Art, The V&A Museum, The British Film Institute, The Lumen Prize for Digital Art, The British Arts Council, The White Building, Ace Hotel, The London Film School, and Whitcher Projects. She works in London with the artist Billy Childish. This project is generously supported by Arts Council England.